Today I got a call from a friend who was freaking out about climate change. I expect to get a lot of these calls in the future. She wanted to know: how much time do we have left? Should I sell my house and run to the mountains? What about the children? Check out this informative article today in the New York Times: How High Could the Tide Go? Most of the article will induce fear, but the last section indicates that we should have decades to deal with sea level rise. (Note use of “should,” as no one knows the future). 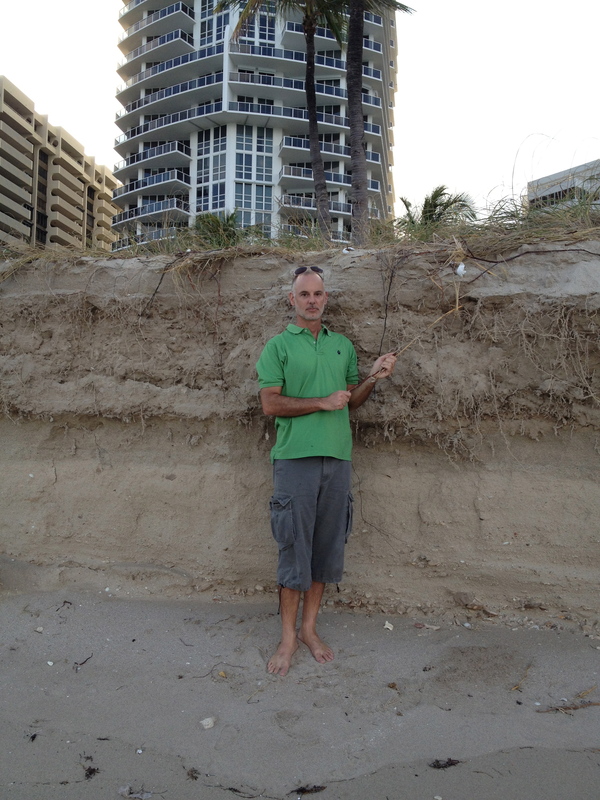 Beach erosion in December in Bal Harbour, without a major storm. Today is the time to learn and prepare, and I am very thankful that President Obama mentioned climate change in his inaugural address yesterday, because more and more people will start preparing and start to ignore the confusion and falsehoods caused by misguided deniers. Climate change deniers are the kind of people who don’t want to know they have cancer until they are dead. The time to panic will be the days before The Big Hurricane hits. You will know when to panic. For example, you panic when a lone gunman shoots randomly into a crowd. You panic when your house is on fire. You panic when a child is choking and cannot breathe. We are not there yet. On the other hand there is much to make us anxious. (Check out the NYTimes blog on anxiety). There are many uncertainties, and uncertainty makes us nervous. We want to know what happens next. We want to know the end of the story. But with climate change, we are searching for clues to what happens next, because it has never happened this way before. Scientists use the past to peer into the future, but such predictions are very complicated and prone to wide fluctuations. How much time do we really have left? For some vulnerable species and places on earth, it is already too late (panic is warranted for the Artic, coral reefs, and the world’s lowest-lying islands). We are losing many natural resources, but there should still be time to save most humans. Today you have the choice to bury your head in the sand, or to look uncertainty in the face and deal with it. The climate is changing, and that means life as we know it is changing. We should deal with this change now–before Mother Nature hits the panic button for us.